The Appear TV COFDM modulator has 4 separate RF outputs and is ideal for feeding RF ring mains, regional terrestial digital TV transmitters or cable headends. Appear TV systems can be equipped with digital QAM output or COFDM output modules to deliver the digital subscriber package, enabling operators to manage both analog and digital services within a common platform, through a single user interface. Ease of configuration makes Appear TV the ideal solution for deployments requiring aggregation of services from multiple sources, service processing and preparation for modulation over broadcast networks. 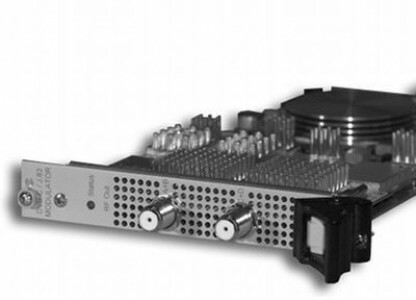 Appear TV offers high performance IP, ASI, QAM and COFDM output modules for direct insertion of digital services into a cable,terrestrial or broadband network. Based on architecture with full digital-modulation and upconversion, the QAM and COFDM output modules deliver clearer signals,and simplify deployment of future enhancements.